Mehdi Hosseini was born in 1979 in Tehran. Hosseini began his musical training in Iran, studying Persian music and the fundaments of composition under the guidance of Farhad Fakhreddini. Following his studies in Iran, Hosseini finished his Master’s degree at the St. Petersburg State Rimsky-Korsakov Conservatory with Professor Alexander Minatsakanian and his Doctor of Music degree (DMA) in Composition with Sergei Slonimsky. 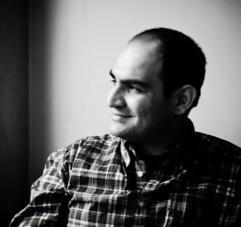 Hosseini also studied composition with composer Nigel Osborn, worked on problems of music theory under the direction of Professor Tatiana Bershadskaya, and is presently a Doctoral Candidate of Musicology at the St. Petersburg State Conservatory. Mehdi Hosseini’s works show a strong monodic music influence, originally interpreted and incorporated into a personal style. He often uses the word monodies not only as the title of his composition, but also as a musical term; by which he means the characteristics of single voice structures, adapting themselves to any musical texture.